This week two HYIP’s from DavidNews.com monitor turned into scam. However, a few new programs have joined us lately and today I am going to review one of them. 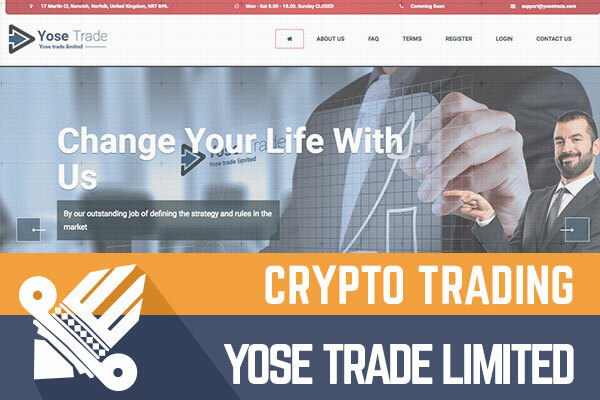 Yose Trade Limited is another cryptocurrency inspired program which has been online for 6 days in total. The program has joined Golden Stage on DavidNews.com monitor on March 5, 2018, and on the 10th of march it has the status “PAYING”. I have reinvested $400 in the program and will keep you updated about the payments status on DavidNews.com monitor. The website of the program promises to “change our lives with them”. Let’s find out how they plan to do it! Yose Trade Limited is a program which I would label as a “simple” HYIP in terms of investment plans. Admin has chosen a straightforward approach offering two simple investment plans – “Fixed Daily” - 1% daily for a lifetime and “Unique Daily” - 1% up to 3 % daily, investment expires on 150%. Initial deposit included in the payments for both investment plans. Minimum deposit is $25 and max. deposit $20000. Yose Trade Limited accepts PerfectMoney, AdvCash, Payeer, Bitcoin, Litecoin and Ethereum. The minimum withdraw is $1. Withdrawals are processed instantly 24/7, however Bitcoin transactions can last for a few hours. Payment days for the first plan “Fixed Daily” are Monday to Friday, for the second plan - Monday to Saturday. Keep reading to find out more about Yose Trade Limited and its features. As I mentioned, Yose Trade Limited is another cryptocurrency inspired program. According to the legend of this HYIP cryptocurrency trading is their main area of expertise. The legend itself is not worth attention. They call themselves a team of professionals who have degrees in The Law and Business of Bitcoin and Other Cryptocurrencies. Of course, it is up to you to believe if any of this is true. Unfortunately, I have to say that the legend of this programs is very generic and most likely it will not be remembered once it will end. Sure, a remarkable legend is not a precondition for a long-term program but still – legends help programs to stand of out the crowd! Feel free to check the website yourself and learn more about Yose Trade Limited. Yes, the legend is quite generic, but admins at least have done the homework regarding company registration details. Company registration number from Companies House is added to the websites footer and the companies’ address on the header. I did check it to make sure if the info matches. Sure, it did! A company with the same name was incorporated on 18 December 2017. As you already know, I am always looking for company registration details, I believe it might add extra credibility for some people and helps choosing the program where to invest in. In the meanwhile, registered UK company doesn’t mean that the program will keep the word and won’t stop paying one day. In terms of the website – a standard HYIP website. Simple layout, classic color scheme, and generic images. Textual information gives you the essence, but not in much detail. Even though I found everything I need to know on the FAQ page, I believe admins could add a few extra sentences to help beginners understand more about the program. In short - it is not the neatest job, but not the most rushed as well. At the end of the day, it is important that the website functions – convinces us to invest, allows us to make deposits and withdrawal money. In terms of functionality, I want to devote a few good words about investor panel. Clean and simple, I don’t have to search for deposit option and most importantly withdrawal option. Easy to follow transactions - both deposit and withdrawal information. This is a kind of panel that I am looking for in every program! The website has a Comodo RSA Extended SSL certificate valid until January 18, 2019. The website is available only in English. However, according to the information on alexa.com, the main audience is from Russia and Ukraine. Yose Trade Limited is a very new program, therefore, there is not much information available about it online. I did also check several forums and only found some random chatter about amounts deposited and a subjective opinion on legend, investments plans and the website. I believe a program like this needs some time to attract potential investors. Especially offering investment plans for a lifetime. Yose Trade Limited also offers 10 level affiliate program. Feel free to find out more about its referral program on the website. As I mentioned Yose Trade Limited offers two plans 1% daily for a lifetime or 1% up to 3% daily - initial deposit included in the payments. As I am not sure if any of HYIP programs will survive a human lifetime, I will take a closer look at the second plan, which will expire on 150%. An investment of $200 in the plan “Unique Daily” will generate a net revenue of $100 over some time. Honestly it doesn’t seem like the most profitable plan. However, it might look as an attractive long-term plan for someone, but it’s not clear how long is the term! I would assume that plan “Unique Daily” has 1% daily rate and it takes 150 days to end the investment term. Basically, we are talking about 0.67% net interest rate a day for 150 days. Even though, I said that the investment plans are straight-forward, I have to admit – Yose Trade Limited is a bit tricky. I have changed my mind while writing this review and should say it’s hard to understand what’s what. For example, in the second plan it’s not clear what impact the interest rate and how many days it will take to generate the net revenue shown in the calculator. Yose Trade Limited is the program offering investment plans with long-term interest rates. Probably these are not the investment plans that the majority are looking for, but it might be easier for someone to invest their money in one of the “for lifetime” plans. Is it really going to be a lifetime together with Yose Trade Limited? At the moment it is hard to tell what’s going to happen with this program tomorrow or next week. Therefore, if you ever decide to make any investments, don’t invest more than you can afford to lose! Have you already made an investment in Yose Trade Limited and have any useful information to share with us? Please drop a message in the chat box to share your experience! Investment plans: 1% daily for lifetime or 1% up to 3% daily (expires on 150%). Initial deposit included in the payments. Join Yose Trade Limited Here! Bannerizer made it easy for you to promote ClickBank products using banners, simply visit Bannerizer, and get the banner codes for your selected ClickBank products or use the Universal ClickBank Banner Rotator Tool to promote all of the ClickBank products.